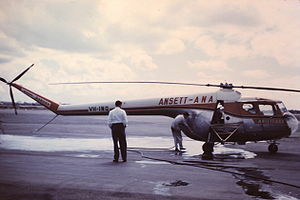 Picture - Bristol 171 Sycamore in Ansett-ANA service in Australia around 1960. Note possible spraying arm attachments. The Bristol Type 171 Sycamore was the first British-designed helicopter to fly and serve with the Royal Air Force. Created by the Bristol Aeroplane Company, it was used for search and rescue and anti-submarine warfare. The name refers to the seeds of the Sycamore tree, Acer pseudoplatanus, which fall with a rotating motion. Bristol set up its Helicopter Department after the Allied invasion of Europe in 1944, when engineers from the Airborne Forces Experimental Establishment at Beaulieu became available. The AFEE had been working on the development of helicopter designs under helicopter pioneer Raoul Hafner, but the success of Horsa and Hamilcar gliders during Operation Overlord led to helicopter research being given a priority at AFEE. Picture - Bristol 171 Sycamore in Royal Australian Navy service around 1960 taking off from the flight deck of HMAS Melbourne. The design of the Sycamore commenced in June 1944, and extended over more than two years, with especial emphasis being given to the endurance of the mechanical components. The maiden flight took place on 27 July 1947, with the prototype VL958 powered by a 450 hp (340 kW) Pratt & Whitney Wasp Junior (there being no suitable engine in the Bristol range). The prototype Sycamore Mk.2 was completed in the summer of 1948, powered by a 550 hp 410 kW) Alvis Leonides; this became the standard engine for all subsequent Sycamore production. Versions of the Sycamore up to and including the Mk.3A kept to the standard two-seat aircraft layout of having the pilot in the left-hand seat and co-pilot in the right. The main production, the Mk.4, switched to the American standard practice of having the pilot's seat on the right. There were also a number of other developments from earlier versions, such as a four-door design, that were standardized for the Mk.4. This version entered RAF service as the H.R.14. Civil versions did not use the name Sycamore, and were known simply as Bristol Type 171. The Sycamore H.R.14 entered service with 275 Squadron of the RAF in April 1953, and went on to serve with nine squadrons in total. It was used during the Malayan Emergency (1948-1960) for deploying Army foot patrols into the jungle. A total of 50 Sycamores were delivered to the German Federal Government, and three to the Belgian Government. The Sycamore also has the distinction of being the second helicopter type to be used by the Australian Defence Force, when seven were delivered to the Royal Australian Navy. Mk 1 Prototype; two built. Mk 2 Second prototype; one built. Mk 3 Production model with five-seats in a widened fuselages and a shortened nose to improve visibility. Fifteen built. Mk 3A Civilian version with additional freight hold, two built for British European Airways. Mk 4 This was the main production model and similar to the military version called Sycamore with a more powerful engine. (=Mk.3) 1 built for evaluation by the Army Air Corps as an air ambulance. (=Mk.3) 4 built for evaluation by the Army Air Corps, as communications aircraft. (=Mk.3A) 4 built for the RAF for evaluation as search and rescue aircraft. 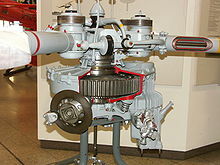 (=Mk.3A) 2 built with rescue winches for the RAF for evaluation as search and rescue aircraft. 3 built for the Belgian Air Force, for use in the Belgian Congo. 3 built for the Royal Australian Navy, for search and rescue, and plane guard duties. 7 built for the Royal Australian Navy, for search and rescue, and plane guard duties. 50 built for the German Army and Navy. Royal Australian Air Force - Only two Sycamores were in service with the RAAF from 1951 to 1965. The two helicopters were used for general support duties at the Woomeria Rocket Range in South Australia. Bridgman, Leonard, ed. Jane's All The World's Aircraft 1951-1952. London: Samson Low, Marston & Company, Ltd 1951.